The bizarre “Tully Monster” a very peculiar sea creature that swam in the tropical waters that once covered Illinois (United States), has finally been allocated a position on the tree of life. So weird was “Tully” or to give this thirty centimetre oddity its formal, binomial scientific name – Tullimonstrum gregarium, that palaeontologists could not classify it even to a Phylum. However, a new study published in the journal “Nature” has finally solved this riddle. It is a soft-bodied vertebrate, one that is related to extant jawless fish such as Hagfish and the Lamprey. Fossils found in 1958, described in 1966 but not classified until 2016. The story of this strange creature begins in 1958 when amateur fossil collector Francis Tully stumbled across a specimen whilst exploring the silt and mudstone beds of the Mazon Creek Formation that are exposed in Grundy County Illinois. The fossil was studied by palaeontologists at the Chicago Field Museum and, with more specimens having been recovered from the same location, the first formal description of this marine animal was published in 1966. Since then, it has been described as a nektonic mollusc, an Arthropod, a marine worm and even a Conodont (a jawless chordate, possibly related to primitive, jawless fish). Thousands of specimens have been collected from the Mazon Creek beds, but this fossil has not been recorded anywhere else in the world. This animal had no bones or hard parts, but seemed to have been an active swimmer, due to the fact that there is some evidence of streamlining of the body and fins to provide thrust and manoeuvring in open water. The long body had a thin bar crossing the top (or could that be the bottom)? This bar showed that at each end there was some sort of organ, this has been interpreted as an eye. Reaching forward was a long, delicate proboscis which seemed to end in a mouth with up to eight primitive teeth in the jaws. 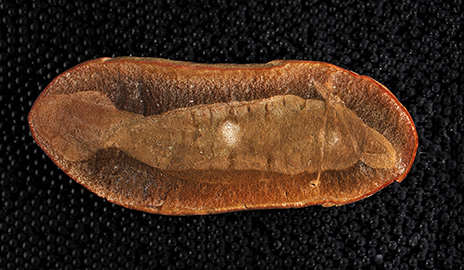 This appendage must have been quite delicate, as despite the exceptional preservation conditions associated with the Mazon Creek Formation, less than 5% of all fossil specimens preserve this proboscis in its entirety within the fossil. This enigmatic marine animal, probably lived in open water, but storms washed these creatures into the shore and they ended up stranded on the mud and silts of a river estuary. The high levels of iron found in these sediments helped preserve these and other soft-bodied animals, providing a unique faunal record of life 300 million years ago (Late Carboniferous). Scientists from Yale University, along with collaborators from The Field Museum, The American Museum of Natural History, Argonne National Laboratory (Illinois) and Yale Peabody Museum examined some two thousand fossil specimens and conducted an array of tests and assessments including sophisticated synchrotron elemental mapping techniques (thanks to Argonne National Laboratory). The synchrotron study permitted the team to identify the anatomy and physical features of the creature by plotting the chemical signatures left behind by organic material preserved in the matrix. The scientists were able to confirm that T. gregarium had gills and a rudimentary notochord, which functioned as a backbone. Neither of these two features had been recognised before. With its formal classification now assured, the celebrity status of this foot-long oddity is unlikely to diminish. In 1989, Tullimonstrum gregarium became the official fossil of the State of Illinois. Some intriguing questions remain. The fossils of this animal are confined to one location, no one knows when these animals evolved, or even when they became extinct, perhaps somewhere out there on the immense abyssal plain a “Tully Monster” still lurks. Now that’s an interesting thought.